ABBYY is a leading provider of document conversion, data capture, and linguistic software and services. The key areas of ABBYY's research and development include document recognition and linguistic technologies. Today, ABBYY is an international company with over 900 employees worldwide (as of January 2010). ABBYY products are being sold in more than 130 countries around the world through an extensive network of regional and international partners. The overall number of users of ABBYY products, which range from end user applications for PC and mobile devices to enterprise solutions and development tools, exceeds 30 million people according to internal research. As one of the leading providers of solutions and technologies for document conversion, data capture and linguistic software, ABBYY aims to simplify the transition from paper documents to electronic information, eliminating typical time-consuming tasks such as manual data entry and the retyping of text. This enables educators to improve learning processes in colleges, universities and other academic establishments. ABBYY's linguistic products also breaks down language barriers for facilitating easier and clearer communication. ABBYY provide easy to use, inexpensive software; used in schools, colleges and universities by Teachers, Administrators, Students, SENs and ICT Co-ordinators. Get more from business cards. Scan paper cards into actionable contacts. ABBYY Business Card Reader is compatible with Windows 8 / 8.1. Both 32 and 64 bit systems are supported. See the full specification list. 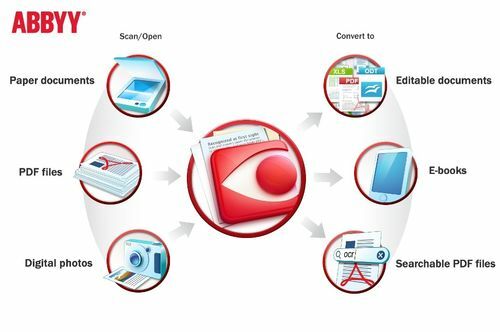 Convert scans, images and PDFs into editable documents with unmatched accuracy. Scan and convert paper documents, PDFs and digital photos of text into editable files on Windows PC. Streamline document conversion among workgroups in business, government and academic environments. ABBYY offers volume licenses at attractive discounts, enabling companies to streamline resource intensive retyping and document digitization tasks, cut costs and free up staff time. FineReader converts scanned paper documents, digital images of texts and image-only PDFs into actionable formats such as Microsoft® Word, Excel® or searchable PDFs, enabling you to quote or entirely reuse text and table content without retyping. FineReader software is powered by award winning ABBYY OCR technology. OCR, or text recognition, uses intelligent algorithms that convert images into editable text, preserving the original layout and formatting of the initial document. Instant access to high-quality translation dictionaries. ABBYY Lingvo Dictionaries for desktop and mobile devices let you translate words, expand your vocabulary and master foreign languages. It contains trusted dictionaries for up to 29 languages, including German, Spanish, Italian, and English. Read, comment, edit and protect PDF documents with ease.